Flowers planted around an assisted living community dance with the wind as they wel­come a potential resident and her family. The tulips along the walkway bring a smile to the face of the woman in search of a new home. She walks into the facility dining room and is presented with a plate of fresh, organic veg­etables of beautiful colors. As she tours the rest of the facility, she notices the bus­tling of residents congregated in the backyard. She ap­proaches them and realizes that they have cultivated a beautiful garden. Before she walks away, a kind man passes her a giant tomato. “I assure you, it is the best you’ll ever eat.” She is sold; this is the place she wants to live. Gardening strengthens muscles and bones, relaxes muscles and helps prevent diseases such as osteoporosis. Planting seeds in soft soil works the hand muscles and massages the joints, and because the task is rewarding, residents do not realize they are participating in physical therapy. 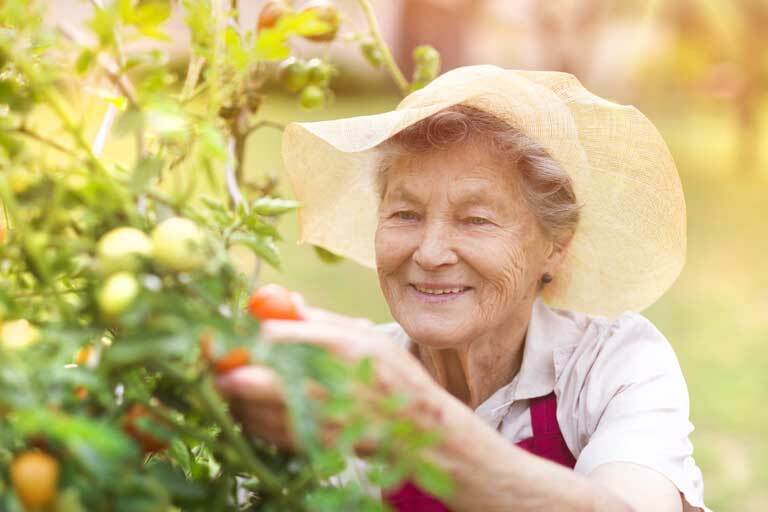 Many long-term care employees report that garden­ing motivates residents to leave their rooms, eager to spend time in the warm sun, which, in turn, adds to their life span. Age affects every individu­al differently, but for most, it seems to be a thief, stealing a person’s independence. Many individuals in senior care communities find that they have lost control over areas of their lives. Ac­cording to the National Insti­tute of Mental Health, depres­sion in the elderly increases when ability to function becomes limited. Gardening provides an outlet for these individuals to regain a sense of control. The intensity of gardening is versatile and can be adjusted to accommodate physical ability. For residents who are mobile, it strengthens walking and balancing skills. For those who may be confined to a wheelchair, it allows them to stretch muscle groups they do not normally use, while strengthening hand-eye coordination. Also, the physi­cal activity of gardening releases endorphins, causing stress levels to decline dramat­ically. Gardening, then, lends a feeling of satisfaction, mastery and accomplishment. The benefits of gardening do not stop there. A garden can be a meeting place for social interaction among residents. Gardening heightens the senses and, for many, sparks memories of past days. It creates an interest in the outdoors, which gives resi­dents a change of scenery. Being in a serene environment also encourages meditation and thinking. A garden benefits not only the residents involved, but everyone who contributes to the success of a facility. Amidst a very fast-paced culture, it is important for residents and those who care for them to take a step back and smell the flowers. It is a reminder that the meaning of life is not defined by the amount of hours we log, the zeros on our paychecks or the titles which shadow our names. Rather, it is the pleasure of living every­day on this good earth that bears the fruits of our labors of love.